Seahorses are a visitor favorite at the Aquarium. 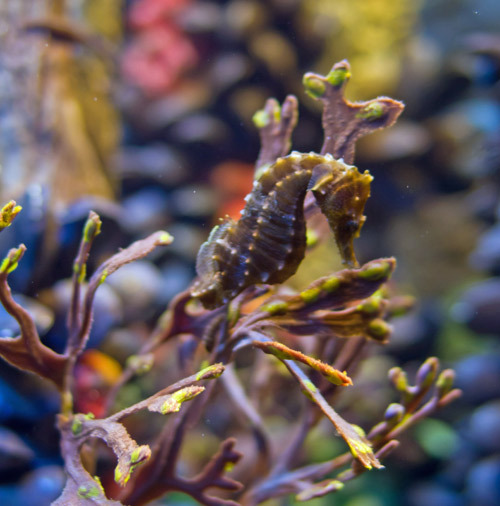 This unique exhibit provides a variety of angles for viewing seahorse behavior. A couple months ago, I was feeding the seahorse exhibit and noticed some very intense behavior among the seahorses. One female was resting among the algae in the exhibit while her pair bonded male hovered around her. If other males came near her he would chase them away by bumping heads with them and even using his tail to drag them away. Check out this video showing some of that territorial behavior. Months later the seahorses are still at it. This footage shows one seahorse dragging another around the exhibit. Info Alert! Do you know male seahorses have a pouch on their belly? The male gets the eggs from the female and carries the "fry" much like a female kangaroo carries a joey. Yep! The males get pregnant. If you look closely in the video, you’ll notice that the male seahorses have puffed up pouches. When they are being territorial, a male seahorse will fill his pouch with seawater to look big and impressive to his mate. Want more stories from this exhibit? Check out this video of a stickleback making a nest. And don't miss this classic story of a rescued juvenile cowfish who spent some time in the seahorse exhibit, more background on that little guy here. Finally, you have to see this video captured by Dave of a hermit crab hatching eggs on exhibit. It's not in the seahorse exhibit, but right nearby in the Edge of the Sea Touch Tank, which is being completely renovated right now. During the video, at the 30 second mark, the pair-bonded male nips at the intruding male. This is very aggressive behavior for the normally social seahorses. The damage from the nip to the gill covering of a seahorse can lead to infections that require medical attention. This is one angry seahorse!